World Suicide Prevention Day - Henhouse Design Co. It's been one year since I lost my friend Jenny to suicide. I've rewritten this post no less than 100 times, and contemplated not publishing at all. In the end, I found it too ironic that J left us on a day that most people are campaigning to save lives, and decided this story was one that needed to be told. I'd be lying if I told you I feel any better today then when I first found out a year ago. This year has been filled with so much hurt, and anger, and sadness. Like most friendships, Jenny and I weaved in and out of each others lives since I was a senior in high school. We'd sometimes go months or years without talking, but then pick up right where we'd left off. Since she left us a year ago however, not a single day has gone by where I don't miss Jenny and wonder how I could have prevented this from happening. Some good things have come out of this too though. I've since connected with Jenny's friends – a wonderful group of girls across many cities and states that I'd only heard her talk about before, but we are now bonded together over this thing that happened to us. It's been the best kind of support system. I also know to lean on my friends a little more now. Tell them I love them. If something bad happens to them, make sure they know I'm there. And finally, should they be in a place of darkness, make sure they have the resources they need to get help. I've been thinking for a long time about what I could do to raise awareness for World Suicide Prevention Day. My husband and I decided it would be great to have something that signified you were an ally - someone a friend could come talk to should they ever be contemplating suicide or just going through a hard time. 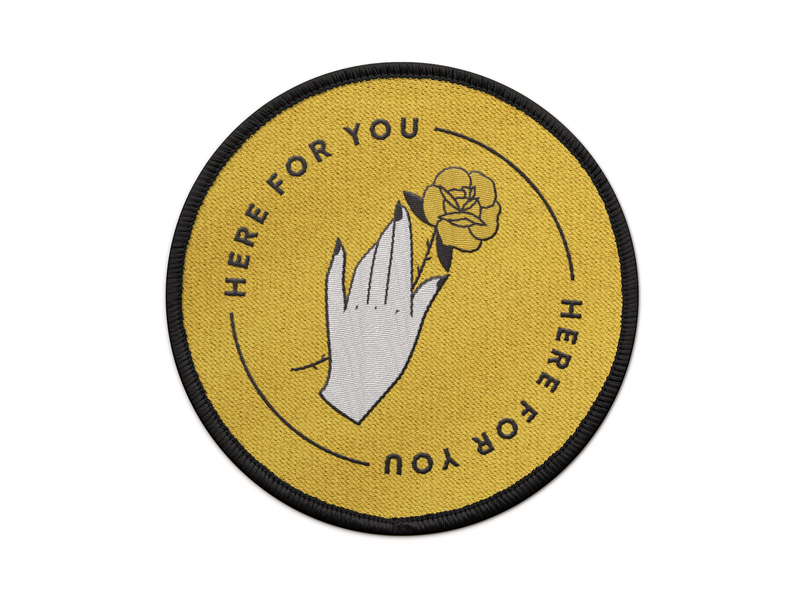 So I've designed the patch you see below - letting people know that you are there for them. In addition to the patch, I wanted to make sure I was getting out resources for help to as many people as possible. Each patch will be accompanied by a postcard. On the back of each card will be the number for the national suicide hotline, along with space to write the numbers of other hotlines, your own number, and a note. Depression can be difficult and awkward to talk about on both sides, so I thought designing something that you could quietly pass to a friend or leave on their doorstep should they need it would be the best way to get them references to help. The patch is for sale for $15 and 100% of profits will be donated to the American Foundation for Suicide Prevention. The product is very much in a preorder state (I just wrapped up the design this morning), but if you'd like to go ahead and make a purchase you can use the link below. Preorder the patch and postcard.